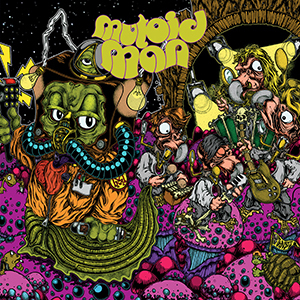 MUTOID MAN is Steve Brodsky, Ben Koller and Nick Cageao. A “super group” of sorts, or more aptly friends playing together…folks in Austin are all too familiar with bands overlapping and it’s a running joke with me that if you are a musician in Austin and you aren’t in at least 5 bands, you’re a slacker. 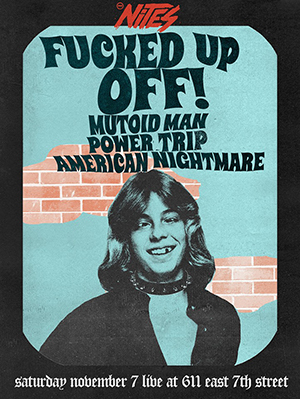 In the case of Mutoid Man, these dudes are New England rock/metal dudes who turn it to 11 in this incarnation. Steve Brodsky’s main gig in the past has been in Cave In, with Ben Koller intertwined with Converge. Something along those lines. It is a Wikipedia mess trying to straighten it all out, haha. They put out an EP in 2013 titled “Helium Head” that literally turned heads. Folks were wondering if it might be a one-off type of album. 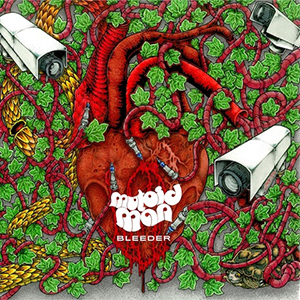 Fast forward to June 2015, and boom, the new album “Bleeder” dropped and even better a tour ensued. This time instead of an EP, we are treated with a full length album. Rock, metal, rock, metal. You can check it out on Bandcamp, or stream/buy on various outlets like Google Music, iTunes, or hell I”m sure it is on Spotify too. Buy it and thank me later. This entry was posted in Commentary, Event - Show - Festival, FFF Fest, Live Shots, Photography, Reviews and tagged BenKoller, jerrymilton, MutoidMan, NickCageao, SteveBrodsky. Bookmark the permalink.